Deluxe keyboard drawer moves keyboard and mouse off the desktop to save work space. Three height adjustments suit your preferred work position and place drawer 2-1/8"", 2-1/2"" or 1-3/4"" below the track. 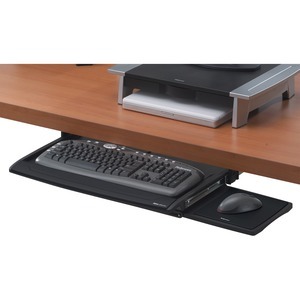 Mouse tray mounts to right or left side of the keyboard tray or stows underneath when not in use. Soothing, memory foam wrist supports with Microban antimicrobial protection stay cleaner and place hands/wrists in neutral position. Ball-bearing glide tracks ensure smooth drawer movement. Drawer is easy to install and adjust and fits standard and ergonomic keyboards. Travel Glide track is 10"" long.